Mount Rainier, the most iconic natural image in the state of Washington, towers 14,409 feet above sea level. The active volcano, said to be due for an eruption at any time, is the state symbol, found on everything from license plates, to beer cans, to nearly every postcard. Locals are so used to seeing Mount Rainier, we don’t even call it by name, and instead we simply refer to it as The Mountain. With so many views of Mount Rainier possible around the Evergreen State, it can be tough to choose the best one. Many prefer views of this glaciated peak from inside the park, next to a reflecting lake or from the summit of another mountain, but one hike to a rocky outcropping may just be the best and most accessible hike. 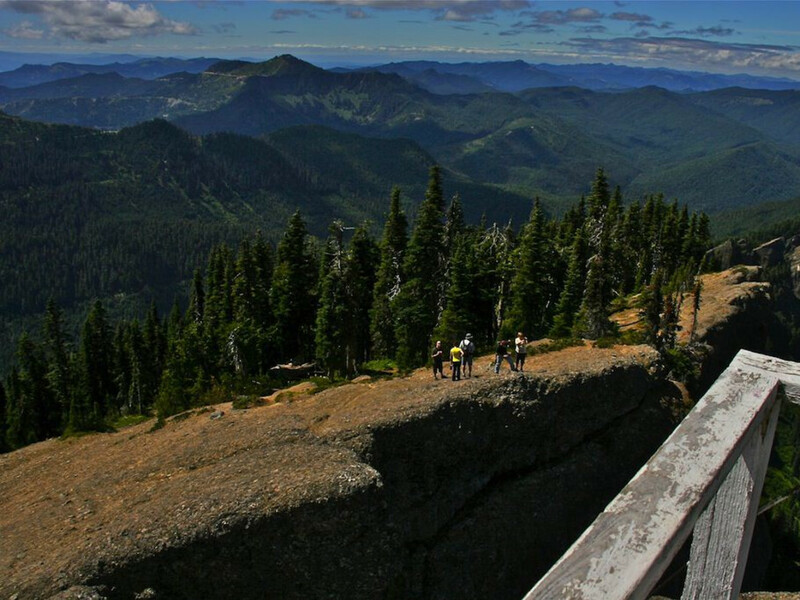 Breathtaking views, staggering heights, and awesome panoramic views are waiting for you on the little known High Rock Lookout Trail, just a few miles outside of Mount Rainier National Park. 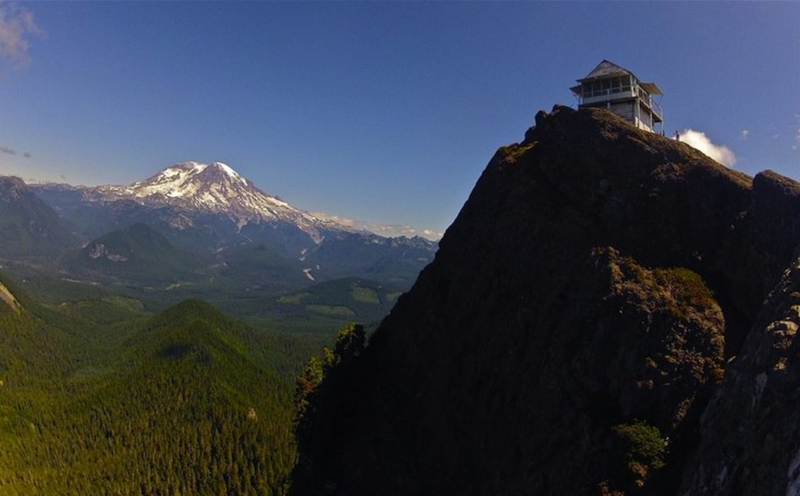 High Rock Lookout, built as a fire lookout in 1925, is truly one of the most spectacular places to stand and gaze at the beauty of the Pacific Northwest. 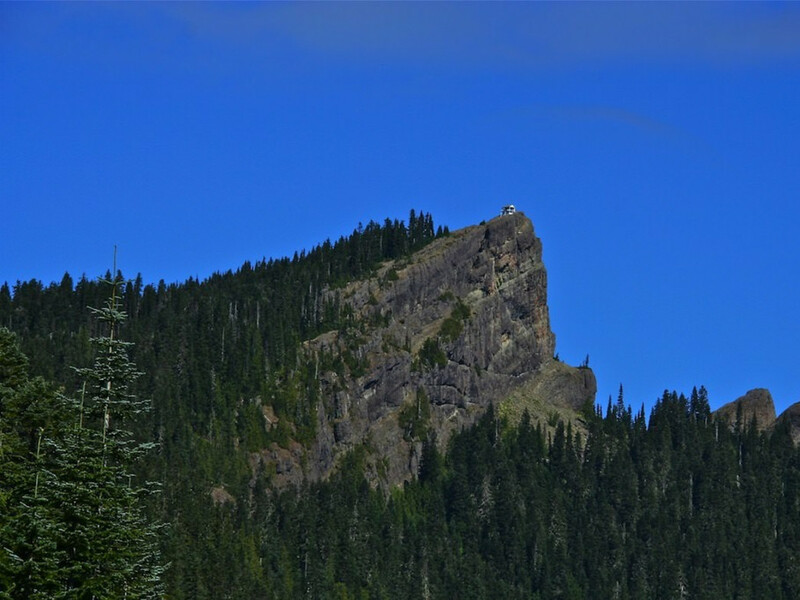 With views almost as dizzying as the 600 foot vertical drop at your feet, while you stand facing Mount Rainier, High Rock Lookout needs to be added to everyone’s hiking bucket list. 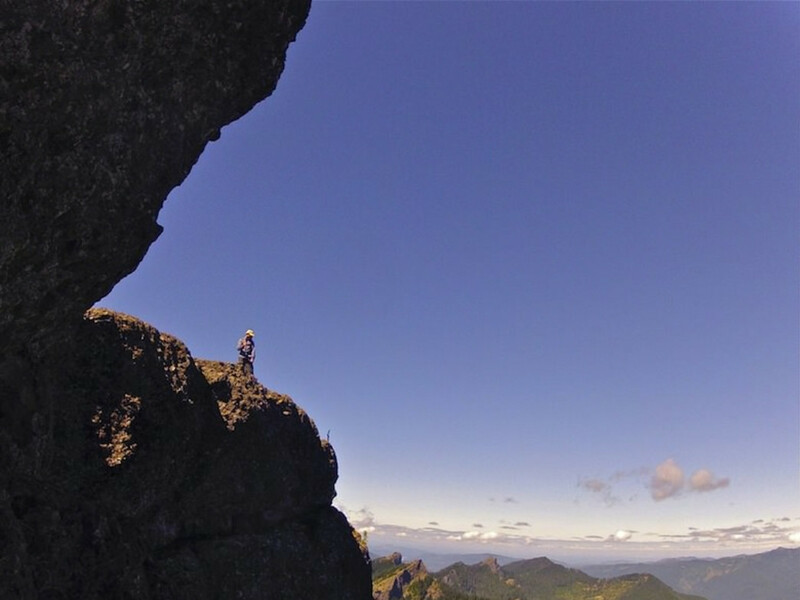 The easy to follow trail climbs 1,365 feet in 1.6 miles, making it a bit of work for those not used to the climbs of the Cascade Mountain Range. While some consider it steep, this local favorite trail is frequented by visitors of all ages and hiking skills. After you reach the top and see the view, you'll understand why. Mount Adams, visible to the south, appears on the horizon as a tiny replica of Mount Rainier. Further south, Mount Hood peeks over the smaller hills, as does the crater of Mount Saint Helens. To the east, the blue sky appears huge over the rugged, dark green tree-covered hills and mountains of the Cascade Mountains. Gazing toward the west in the direction of Puget Sound, this rocky ridge appears to defy gravity, dropping straight down nearly 750 feet to the valley floor below. The steep ridge continues to the lookout, where you can look straight down at Cora Lake, the dark blue standing out against the green trees. 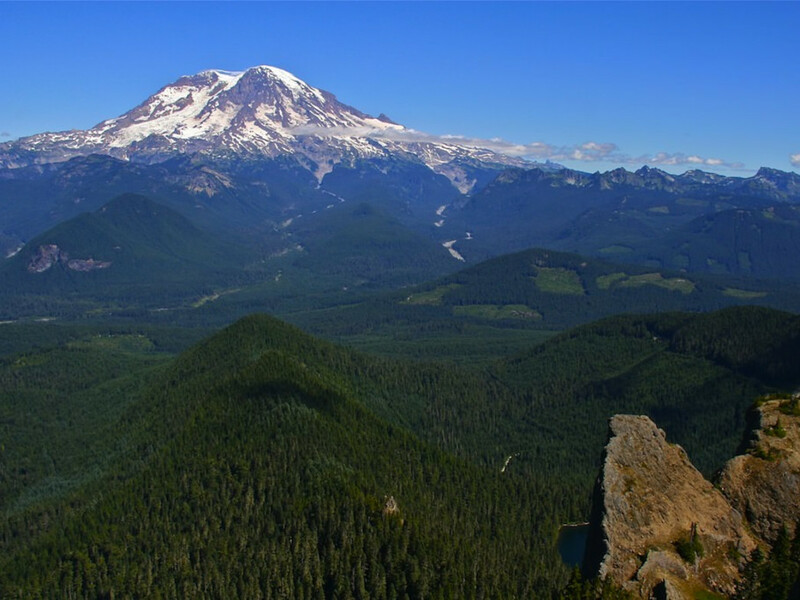 As your eyes elevate past the glacial fed Nisqually River and valley, Mount Rainier presents herself in all her glory, standing taller than many have ever seen her snowy slopes. The view from High Rock Lookout, which is the name for the old lookout sitting atop the highest rocky point, is staggering. The cliff to the north is impressive and can cause bouts of dizziness for those with height issues, but the knife ridge you are standing on doesn’t seem any less dangerous in any direction. Some who dare hike to the summit are overcome with vertigo and have needed to be rescued from the top. 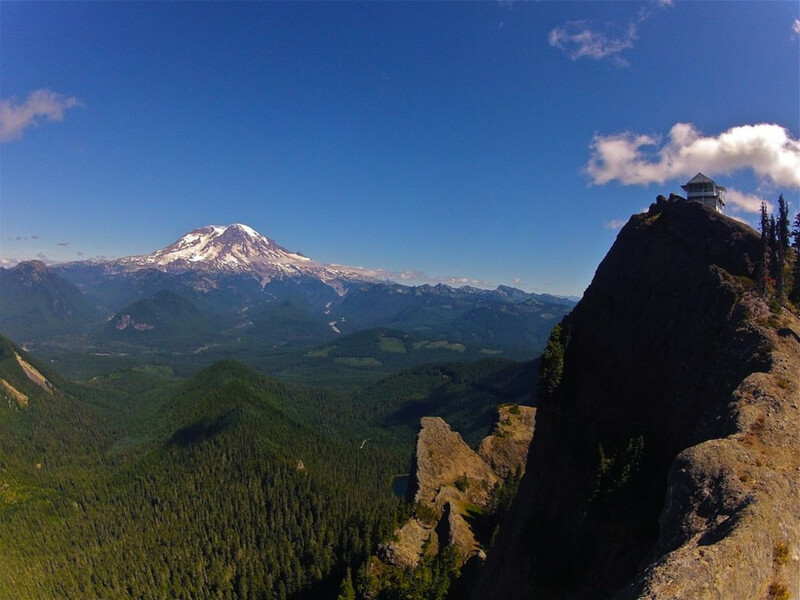 However, nearly all hikers who take their time and know their limits are able to enjoy this amazingly rare, unique and impressive view of Washington State’s mountain. Just twenty miles as the crow flies away from the 5,685 foot High Rock Lookout, Mount Rainier towers over you by nearly 9,000 feet. There are no mountains or hills blocking your view of this majestic mountain, just a deep river valley and the wilderness of the Pacific Northwest. 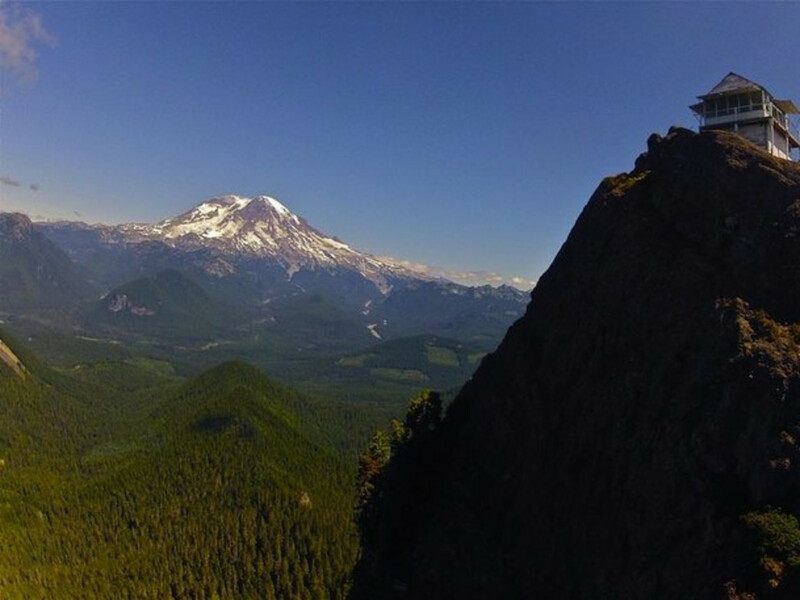 This is the ultimate view of Mount Rainier and is well worth the detour from your trip to Paradise in Mount Rainier National Park.